Did Christ record you among the living after death. On the thirty-first Melania was taken away from life. 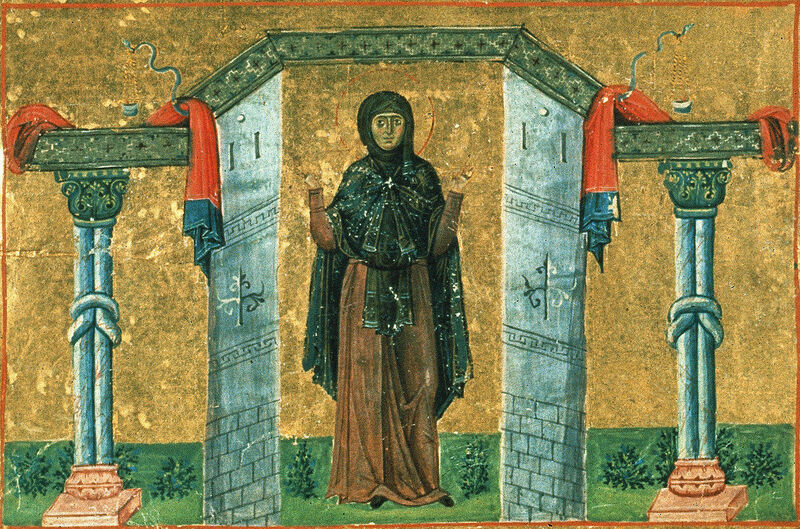 This Saint lived during the reign of Emperor Honorius (393-423), son of Theodosius the Great, and was from a wealthy and illustrious and glorious family. Because she loved the Lord with all her soul, she preferred to live a life of virginity. Her parents however joined her in marriage against her will with a man. * By this she became the mother of two children. Later the parents lost their children to death. For this reason the blessed one left the city of Rome, and went to live in its suburb, and there she pursued every form of asceticism and virtue. ** She took care of the sick, received strangers who came to her, and visited those in prison or exile. After this she sold all her many belongings and properties, and gathered from them twelve myriads of gold, namely one hundred and twenty thousand florins. These she distributed to churches and monasteries. Initially, she ate once every two days. After these things, she fasted five days a week, eating only on Saturdays and Sundays. The renowned one was in the habit to exercise every form of asceticism with much knowledge and discernment, and produced calligraphy that was very beautiful and artistic. Later she went to Africa, where she lived for seven years. Having distributed most of her wealth, she went to Alexandria. *** From there she went to Jerusalem. There the blessed one enclosed herself in a cell. **** By her example, she drew towards a similar form of asceticism ninety virgins and nuns, to whom she gave without ceasing the needful things of life. Because she was overcome by pain on her side, she became very ill. Therefore she invited the Bishop of Eleutheropolis, and received from him Divine Communion. Bidding farewell to all the sisters, she departed voicing as her last words those of Job: "As it seemed good to the Lord, so has it come to pass" (Job 1:21 LXX). Then the renowned one immediately delivered her soul into the hands of God. * She married her paternal cousin, Valerius Pinianus, at the age of fourteen. ** Melania and Pinianus left Rome in 408, living a monastic life near Messina (Sicily) for two years. In 410, they traveled to Africa, where they befriended Augustine of Hippo and devoted themselves to a life of piety and charitable works. Together they founded a convent, of which Melania became Mother Superior, and cloister of which Pinianus took charge. *** Melania had "vast domains in Sicily" and also held land in Britain. Moreover, she owned grand estates in Iberia, Africa, Numidia, Mauretania and Italy. Gerontius her biographer describes one of her estates as follows: "On one side lay the sea and on the other some woodland containing a variety of animals and game, so that when she was bathing in the pool she could see ships passing by and game animals in the woods... the property included sixty large houses, each of them with four hundred agricultural slaves." Thus, this one property contained 24,000 slaves. 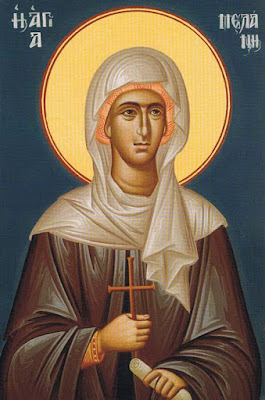 **** In 417, Melania and Pinianus traveled to Palestine by way of Alexandria, living in a hermitage near the Mount of Olives, where Melania founded a second convent. After the death of Pinianus c. 420, Melania built a cloister for men, and a church, where she spent the remainder of her life. She reposed in 434. Melania is known as "the Younger" because her grandmother, Melania the Elder, is also considered a Saint and it is meant to distinguish them. In your fervent desire for the angelic life, you renounced the comforts of this earth. In watchfulness you practiced sobriety and deep humility. Therefore, most wise Melania, you became a pure vessel filled by the Holy Spirit, who adorned you with gifts, attracting all to your divine fervor, leading them to the Master and Savior of our souls. You tread to the end of the path of virtue and were betrothed to God the Word. You rejoiced in the contest, O Anysia; and you, O Melania, shone with the light of dispassion, together, radiant with virtue in the world. And now we ask you to implore Christ the Lord that he may be gracious to us! Being illumined in thy soul with the bright rays of Him that hone forth unto us from a Virgin, with virtues wast thou brilliant, O all-lauded one; for having dispersed on earth thy corruptible riches, thou didst store up for thyself greater riches in Heaven; and in ascetic labours thou didst shine; hence, O Melania, with longing we honour thee. 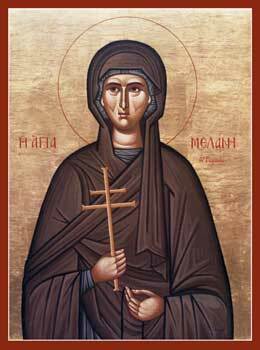 As a doubly-shining lamp, of truly mystical brightness, do ye shine upon the Church, like a high-towering beacon: thou with beams of martyr's glory, O Anysia; thou with rays of great ascetic deeds, O Melania. Now together ye are honoured, by Christ your Bridegroom, for your travails in His Name.